A century ago a young man opened a new ledger book and recorded how well he had done during his first year in business. 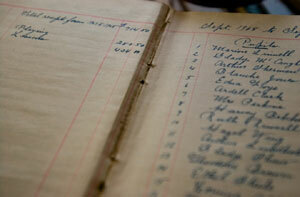 An old ledger details the piano company’s finances from 1907 to 1908. In the total receipts column for 1907-08, Elwin L. Shaw penned in $714.50. He had made $280.50 playing piano for the local church and $434 teaching piano lessons. The following year, the graduate of the New England Conservatory of Music made $1,054. In that 12-month period, he had an outlay of $150 for rent, $2.88 for electricity and $27.75 for advertising. Shaw Piano was on its way to establishing a reputation for excellence in Brockton, Mass. The founder’s grandson, Thomas Shaw, continues the tradition to this day with two major differences. First, since 1987 the business has been renamed Charlottesville Piano Company. Second, it’s making quite a bit more money, having earned $1.2 million last year despite only having five employees on the payroll. What hasn’t changed during the past 100 years is the company’s high standard for integrity and workmanship. 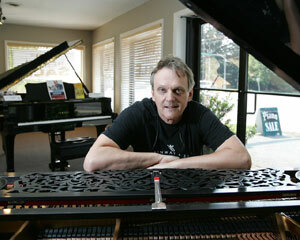 And during Shaw’s turn at the helm, he has earned a national reputation for his ability to masterfully restore vintage pianos, especially those made by Steinway and Sons. Third-generation piano shop owner Thomas Shaw celebrates the 100th anniversary of his family business, the Charlottesville Piano Company. Customers think nothing of giving Shaw deposit checks for thousands of dollars, even before seeing the piano he’s going to restore. Sometimes Shaw hasn’t seen the piano or know where it’s going to come from. “If I believe anything in my life, and this has been passed down from my grandfather and father, it’s honesty,” Shaw said one recent afternoon during a break from working on the action of an antique Steinway piano in his Rio Road shop. “I sell thousand-dollar pianos, and I sell $75,000 pianos, and they all come with [manufacturers’] warranties. But I’ll tell you right now those warranties mean nothing. If you buy a piano from me and it has a problem, trust me, I’m going to be there. Elwin L. Shaw was a piano tuner and technician, but his greatest gift was as a concert pianist and composer. Elwin Shaw’s son, Raymond, was blessed with perfect pitch and was a talented pianist and rebuilder of pianos. Thomas Shaw also has great ears, but he only can play two songs on the piano – “Hey Jude” and “Let It Be.” His gift is realized in his ability to restore old pianos to pristine condition. You can find factory pianos that are good and even great! But everything Tom turns out as a restoration is the kind of instrument that takes your breath away. “The reason for that is real simple. 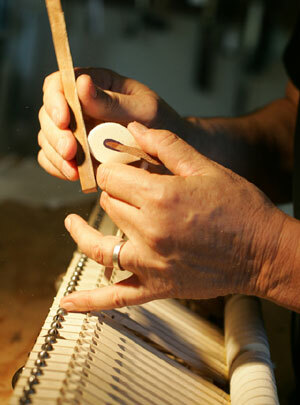 When a factory is turning out new pianos they have to work on a production schedule. So they’re letting pianos go that are OK, but they haven’t reached their level of perfection yet, because the technicians haven’t worked with them enough. “They’re still green. But when Tom turns out a restored vintage Steinway or other fine pianos, they’re perfection. Each and every one of them is the kind of instrument that will take your breath away, because if they’re not ready to go, he won’t let them go.” Shaw’s integrity comes into play when a potential customer approaches him to restore a piano. “It’s very expensive to rebuild a piano, so if it’s not a top-name piano, don’t waste your money,” Shaw said. “Unless there’s some emotional attachment to a particular piano, it won’t make sense to spend $20,000 for me to restore it when it’s only going to be worth $15,000 when I’m done. Tom Shaw fine tunes the action on a hammer for an 1897 Steinway piano. “If someone came to me with a 1907 Steinway grand to restore, I’d do it because after they spend $20,000 on the rebuild it’s going to be worth $45,000. The reason is because that particular Steinway falls between the years 1895 and 1930, when the Steinway company owned and controlled the business. The vintage pianos Shaw generally won’t touch are those that have been rebuilt by someone else. Because the original measurements are so critical to it playing at the level he insists upon, he won’t use the measurements of another rebuilder. Thomas F. “Kookie” Kuck has been working for Shaw since 1990. When an old Steinway comes in the shop, his job is to meticulously disassemble it while keeping track of every piece and where it came from. “Tom is the genius as far as bringing these things back to life,” said Kuck, who has been involved in music all his life and played drums for Mississippi Tom and the Mudcats. “I’ll help put them back together, too, but Tom does all the work on the inner and moving parts. What’s really neat for me is seeing these old pianos come in that you couldn’t play at all. Occasionally, Shaw will work with piano maker Mark Perry on special projects because of his expertise in certain aspects of period restoration. They’re working together on a 1893 custom-built Steinway piano for Montpelier estate. Perry is one of the few people in the world who uses a type of finish and technique called French polish. 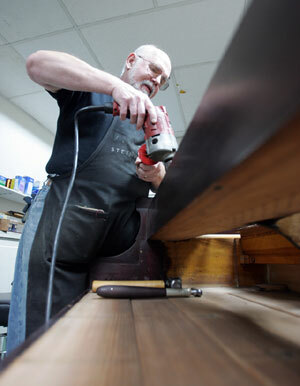 His Lynchburg shop, Perry’s Pianos, specializes in finishing high-end furniture and pianos using this method. “In order to do a period-correct restoration on Montpelier’s custom Steinway piano, it needed a French polish finish,” Perry said. “Almost nobody in the world does this anymore, because everybody is using chemical finishes now. “But it’s one of the only finishes you’ll ever see that allows the light to perfectly penetrate it. It’s indescribably beautiful. 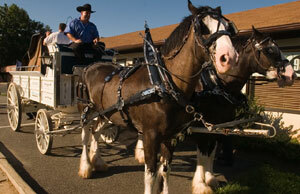 Trey Dillard holds his Clydesdales steady while a piano is offloaded at the piano shop. This is the way the family used to deliver pianos. It took Shaw a number of years to figure out that his future was with pianos. Although he spent many of his formative years working with his father in the piano shop, he didn’t see it as a career. “My dad was a very laid-back guy, unlike myself,” said Shaw, who lost his father in June, 2006, at the age of 87. “I’m definitely a type A and he was a type C, if they make that. “He’d go into somebody’s home to tune a piano, and he’d smoke his pipe and have a cup of coffee. I’m in and out and off to the next tuning. When I was in my teens, I’d be in the store working and these old piano technicians would stop by to visit. After serving a hitch in the Air Force during the 1960s, Shaw moved from job to job. He sold cookware for a few years and then Electrolux vacuum cleaners door to door. 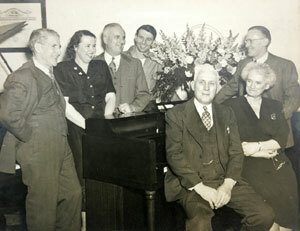 Elwin L. Shaw (third from right) started the business 100 years ago. His grandson runs it today. Shaw was a good enough salesman to win awards, but nothing held his interest for long. In 1978 he went back to work in the family business, which by then was in Plymouth, Mass. “When I took the business over in 1980, I wanted to be the best in my profession,” said Shaw, who was James Madison University’s head piano technician for four years and the University of Virginia’s for 10 years. “My dad had showed me how to work on old upright pianos. He showed me how to reshape piano hammers, clean the keys, put on bridle straps, that kind of thing. “He never knew how to make a soundboard or take a pin block out of a piano, much less make a new one. In this business, the very top level is the rebuilding, not the reconditioning, and there’s a huge difference. Shaw can. He credits his long-time friend Randy Fisher for teaching him the “good stuff” about rebuilding pianos. During Shaw’s days on the road as a salesman, he traveled throughout Virginia, and thought it would be a great place to raise a family. That’s what motivated him to move the company here in 1987, but at that time, his rebuilding education was not yet complete. 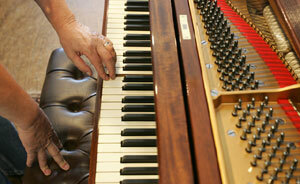 Repairman Tom “Kookie” Kuck works on a 1913 Steinway M at the shop. “When I first moved here, I asked a guy who owns a piano business in Richmond if he would show me how he makes soundboards,” said Shaw, whose company also moves about 600 pianos a year for owners. “He said, ‘No,’ because most people don’t want to share that. Shaw recently turned 61, but he has no plans to retire. He said he loves what he does too much to ever stop. “I have a friend in Massachusetts who owns a piano business, but hates pianos,” Shaw said. “He said he wouldn’t care if someone burned a $30,000 Steinway in his front yard. “He says pianos to him are simply a means to make money. It’s different for me. I have a love for pianos, especially vintage pianos. Old pianos have a presence. Shaw rebuilds every Steinway the same, but they don’t all sound the same. He said the Steinway name ensures that the piano is going to be good, but being great is another matter. “I don’t know if anyone has a complete answer for what makes a piano great,” the father of two said. “I can tell you what makes a piano a piano is the soundboard. “When pianos were made 100 years ago, the soundboards were made of old-growth eastern spruce with really tight growth rings. There’s no more of that around, so if I can find an old Steinway with a soundboard that’s still good, I’ll keep it. In all that time the business that was started by Elwin L. Shaw hasn’t changed much either. But Shaw is saddened by the fact that the century-old relationship his family has had with pianos will likely end with him. “I feel that somehow my father and grandfather are living on through me,” Shaw said. “I’m sad because I think it’s going to end, because neither my son nor daughter are going to do it.